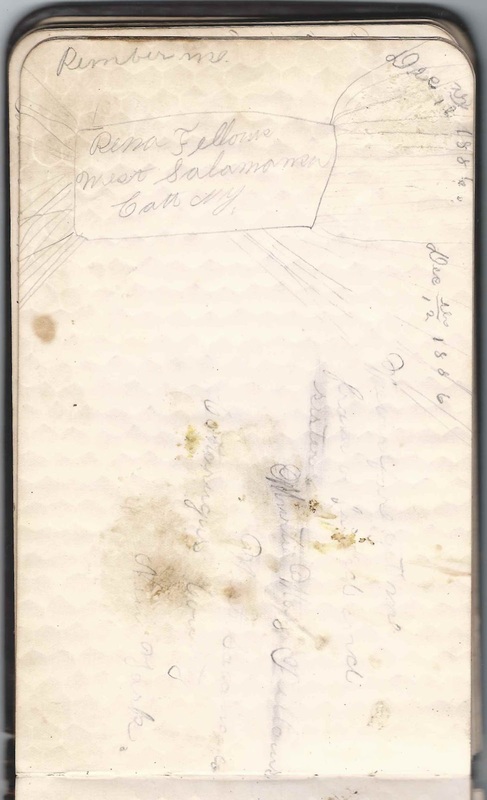 1880s autograph album presented to Lorena Fellows, "Rena", of West Salamanca, New York, by her father, Richard Fellows, on December 25, 1884. 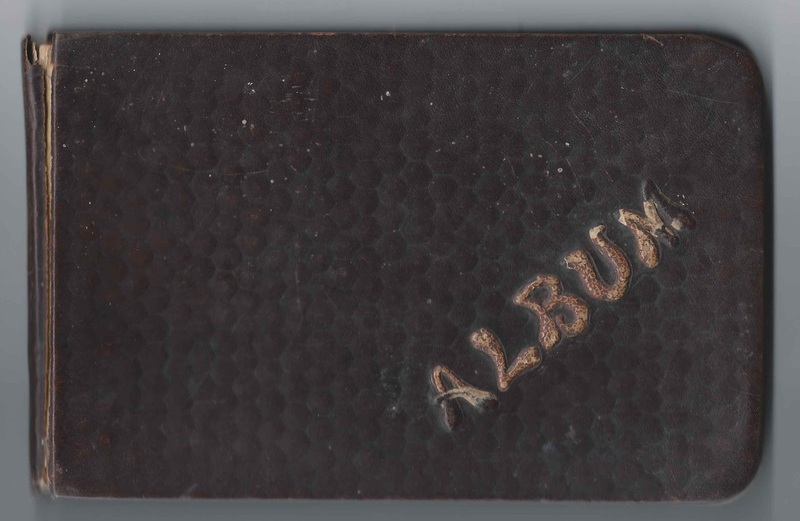 The album is approximately 8" x 6" and contains the sentiments of over 60 of Lorena's relatives, friends and schoolmates. An alphabetical list of the signers appears at the end of this post. Lorena Fellows was born about 1871 in New York, the daughter of Richard and Clarissa Fidelia (Power) Fellows, who were born in Salamanca, New York, and Cherry Creek, New York, respectively. I wasn't able to find a birth record for Lorena. Lorena's mother, Clarissa Fidelia (Power) signed the page after the presentation page signed by her husband Richard. The Murtie M. Fellows who signed a page on October 30, 1888, was likely Lorena's younger sister. Lorena's sister Lavanga Fellows of West Salamanca, New York, signed a page. 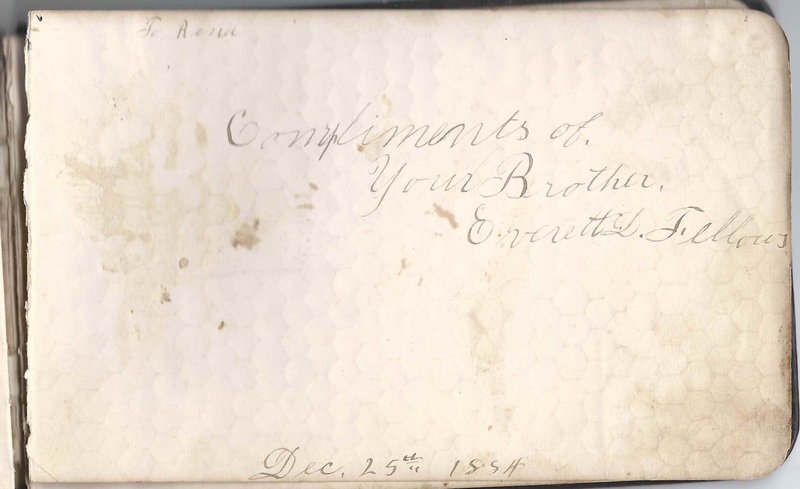 Lorena's brother Everett L. Fellows signed a page on December 25, 1884, the day Lorena received the album. Many other relatives signed pages in Rena's album; refer to the list of signers below; any family relationships expressed are noted. I don't have information on whether Rena married or not. If you have corrections and/or additions to the information above, or information on any of the signers listed below, please leave a comment or contact me directly. Rena, signed at West Salamanca, New York, on November 21, 1889. It's possible that it was Lorena herself who wrote on this page, as it appears that the page was inscribed to "Will"
Dudley Champlin, signed on May 4, 1885; his wife Mrs. L. Champlin also signed this page. Mrs. L. Champlin, signed on May 4, 1885; she was Laura (Ingolls) Champlin, whose husband Dudley also signed this page. Sarah Champlin, signed at West Salamanca, New York, on March 12, 1885. Middle initial might be I or J or ? Richard Fellows, Lorena's father, who presented the album to her on Christmas Day, 1884. Clarisa Fidelia Fellows, signed on February 1, 1884; Lorena's mother Clarissa Fidelia (Power) Fellows. 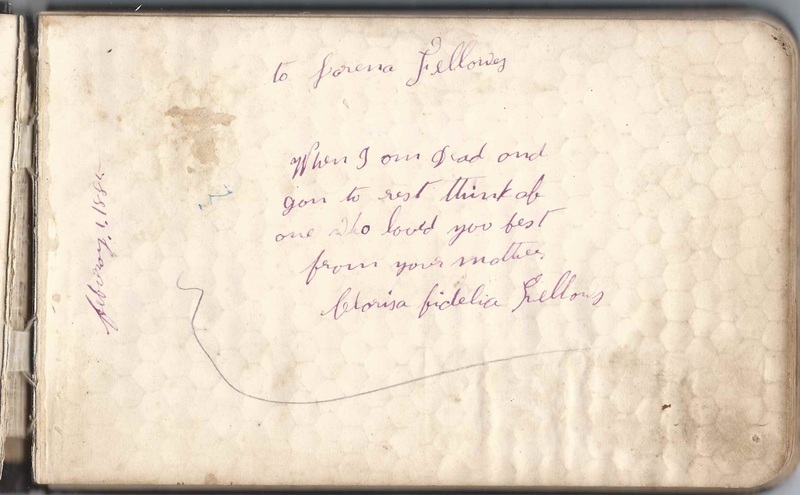 Alonzo Fellows, signed at Salamanca, New York, on June 21, 1885. He was a brother to Lorena's father Richard Fellows. Murtie M. Fellows of Brickl?, New York, signed on October 30, 1888. Presumably Murtie, Lorena's younger sister. 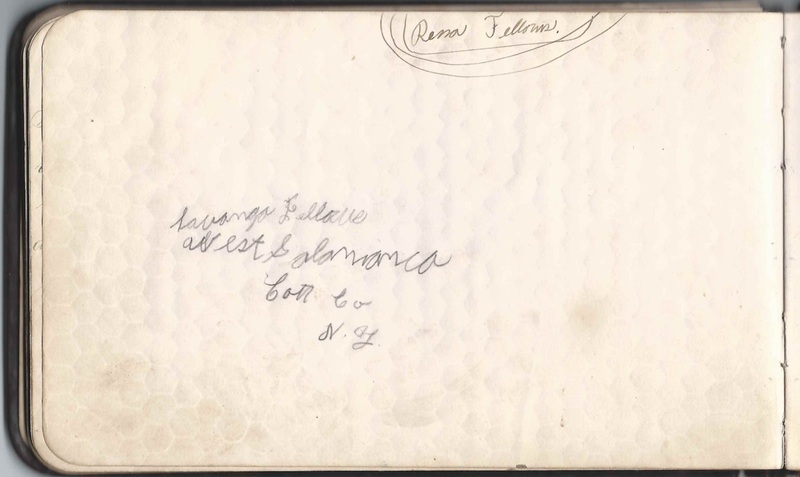 Fannie Fellows, signed at Salamanca, New York, on June 20 [no year written]; Lorena's cousin. She was presumably the Fannie Fellows who was the daughter of Stephen Francis Fellows, brother of Lorena's father Richard Fellows. Mabel Fellows, signed at West Salamanca, New York, on December 9, 1886; her husband Norman Fellows also signed the page. 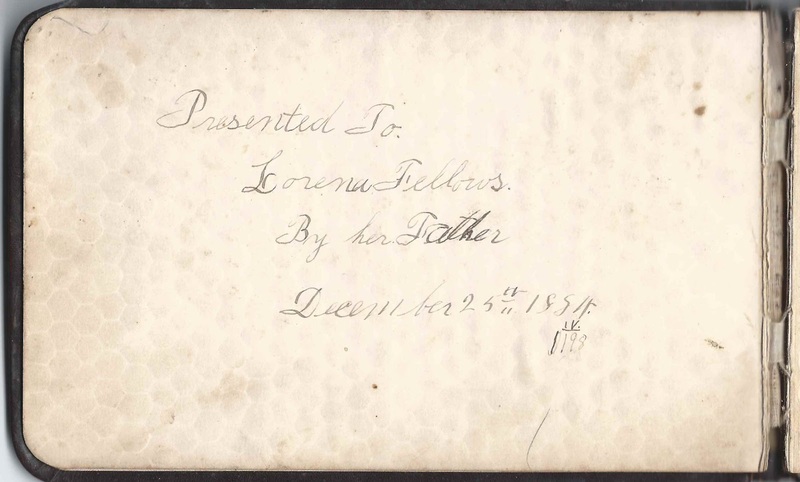 Norman Fellows, signed at West Salamanca, New York, on December 9, 1886; his wife Mabel Fellows also signed the page. Everett L. Fellows, signed on December 25, 1884; Lorena's older brother. Norman Gray of Salamanca, New York; his wife Mary also signed the page. J. W. Moffat, signed on May 2, 1885; middle initial could be M.
L. C. Moffat, signed at West Salamanca, New York, on December 26, 1884. Horace N. Seamens of Napoli, New York, signed February 18, 1885. He was Horace Nelson Seamens; his wife Mary Jane (Barbour) Seamens signed the same page. Mary J. Seamens of Napoli, New York, on March 2, 1885; she was Mary Jane (Barbour) Seamens, whose husband Horace Nelson Seamens signed the same page. Georgia Thompson of 72 __ Street, West Salamanca, New York, signed on January 26, 1885. She left the street name blank.